Many of you are broken. Your lives, in pieces. But you can be restored. I know, I've been there. Let's start with divorce. My parents divorced when I was 11. It was a nasty divorce, one that left me not talking to my Mom for many, many years. I lived with my dad and didn’t see my 2 sisters. After a year my dad met a women. One day I came home from school and they're married. No one told me. All of the sudden, I'm unwanted. They eat at the table, I eat in my room. They go out, I eat microwave dinners. She flat out tells me she doesn’t want me. Then my dad drives me to a field, hands me some cash and a bag of cloths, tells me I'm not wanted and leaves me there. I end up back a few days later and eventually leave, getting kicked out at 16-17. They were Christians, by the way. So at this point, I am screwed up. I’m lonely, unloved, and mad as hell. I start drinking a lot, using drugs, and dating like crazy trying to fill my empty heart. Most people hate me. I’m a jerk that hurts others so I'll feel better. I think I know who Jesus is and it's His fault. Why didn’t he give me parents that loved me or even cared? Every once in a while I go to church and try to be a good Christian, but it never stuck. I saw God as an authority figure who wanted me to be tough and follow a perfect line and I couldn’t do that. I wanted to party and date new girls. Finally I quit trying. I told my pastor at the time, "I'll be a Christian when God gives me a wife." I thought God didn’t really care. I meet my beautiful wife in a bar in 2008. That should have been my first clue that I was wrong about God. We started dating and I started praying, "God let her be the one, let me keep her, please." I didn’t deserve her. She wasn’t a Christian but soon believed in Jesus. We were married in 2010. We are perfect for each other. Until I met Missy I never knew what it was like to really be loved by another person or to love that deeply. We found out we would never have kids and we where sad, but I had figured I would have had a couple different babies by then, so it wasn’t so bad. We bought a house in Borrego and started going to church here. I started really praying and reading my Bible. Day after day, week after week I started to see who Jesus really is. My heart changes and Missy and I are baptized in September 2013. My mom, who I hated and couldn’t stand being around, started really living for Jesus too. Now my mom and step dad are some of my favorite people. I have a great relationship with my father and my stepmother, who came to me crying because God had showed her how horrible she had been to me. My relationships with my family were restored, not because of time or counseling, but because of Jesus. God is not just sitting in heaven watching it all go down like some sort of twisted sitcom. God loves each and every one of us each and everyone of you. 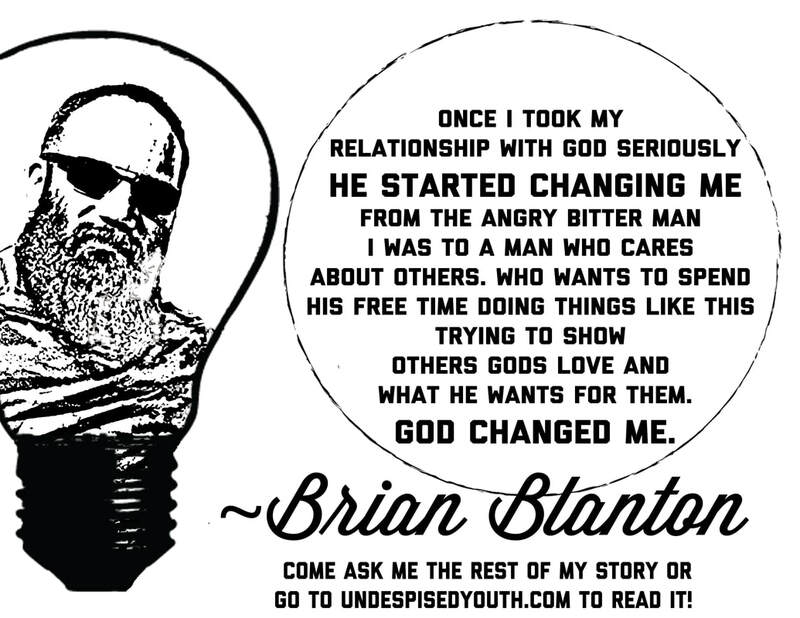 Once I took my relationship with God seriously He started changing me from the angry, bitter man I was, to a man who cares about others. Who wants to spend his free time doing things like this, trying to show others God's love and what He wants for them? God changed me. But God did not stop there. Not only did He restore me and my family emotionally and spiritually, but He also restored us physically. Two years ago we had the baby the doctors never said we would have, a beautiful baby boy. God restores, not because we deserve it, but because He loves us. Jesus’ death and resurrection gave us the ability to be restored. Every adult in here with a red shirt has a Restoration story and they would love to share it with you.